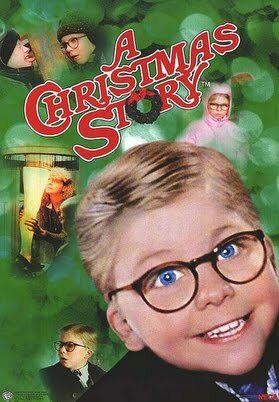 This Sunday we looked at the movie A Christmas Story to give us a fresh perspective on the Christmas story. And we watched this clip of little Ralphie so deeply hoping for a Red-Rider BB Gun. The point of the clip on Sunday was that in our day and age – we don’t hope like Ralphie does. We are so generally worried about “living in reality” that we reing in hope. We don’t place our hopes on getting this one thing. Mary hopes completely in God. She lets her hope in a merciful and strong God run wild. She doesn’t temper her hope with realism, or pragmatism. She hopes against all odds, that God has moved and is working within her. And I think this is something we need to learn at Christmas especially. We need to learn to hope because Jesus is coming. Jesus is coming and with him everything changes. So we need to learn to hope, we need to let our hope run wild. That was the main point of Sunday. To let our hope in Jesus run wild. And like Ralphie so deeply desiring a BB Gun, I asked everone one question: What is it you really want for Christmas? What are you really hoping for? And we’re not talking about gifts or deep desires. Is it for a marriage or body to be healed? To finally find a spouse, or purpose? To have a child, or a have a relationship healed? What is it you really want for Christmas? Because I think that Christmas is a time to let our hope out, to share with God what we need and place our trust in him. That’s what Mary does, and I think that’s what we should do as well. And if there is ever a time to hope, I believe it is now. So why not today answer that question: what are you hoping for this Christmas? Why not share with Jesus and trust in him to act. Because I know we often think about, “what happens if I get let down?” Well I think Christmas is about asking, what if God shows up and comes through. Because that’s what he did way back when, when he entered the world. And I think he can do it today. Big Idea: We need to learn to hope. Advent is a time where we wait and prepare for Jesus. We don’t hope all that much anymore. We don’t get our hopes up, because it is easier, but not necessarily better. We need to learn to hope recklessly. As Christians we can truly hope. What do you really want this year for Christmas? I believe in Hope, capital H, because I believe in Jesus. What stuck out to you from the sermon? What was challenging to you? How did God speak to you through it? What was new? What are some of your favorite Christmas movies? Would you say you’re someone who hopes – or keeps your hopes realistic? How come? What are you hoping for this year? Who are you hoping with that can support you as you watch and wait for God to move? What reasons do you have to hope in God? How has he been faithful to you in the past? How might he be faithful to you this advent? Spend sometime talking with your kids about hope. If they write down what gifts they are hoping for, why not have them make another list. “Things I’m hoping for, or things we can pray for”. Have them make a list of things and then pray over those things, and bring those things to Jesus. Challenge for the Week: Let your hope run wild. Next Does Life Flourish Around Your Church?